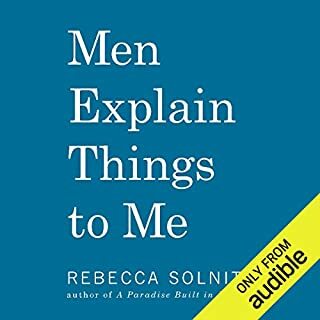 I was interested in hearing what Solnit had to say, but the cheerful and upbeat narrator constantly undercut the gravitas of what she was actually saying. There are a lot of mixed reviews about the narrator on this one. I have friends who hail from the former USSR and speak with a similar accent to the narrator, so I thought I wouldn't have a problem with this. From the standpoint of understanding her words, it wasn't a problem. The problem lay in the fact that she would treat commas (and possibly line-breaks in the text she was reading?) as though they were periods as far as emphasis goes, and that's not bad from an accent-standpoint, that's bad from a reader-standpoint. There are other readers who do this too and every single one of them drives me crazy. That being said, I enjoyed the book and will finish it in print. It was slow to get started and had a few problems, but it's overall pretty good. 1) She read every sentence like she had no idea where it was going or where it had come from. Sometimes I had to pause and re-listen just to change the inflection to make it make sense. 2) Her (non-American) accents were, by and large, *terrible*. I'm not sure why the publisher picked someone who can't do accents to read this particular book. 3) There was a large amount of technical-type text and she was awkward enough with it that it seemed pretty clear that she's not good at tech jargon. In a particularly tech-jargon-filled sci-fi title? Again, I have to wonder at the publisher's choice here. The second narrator didn't always do much better in this regard. 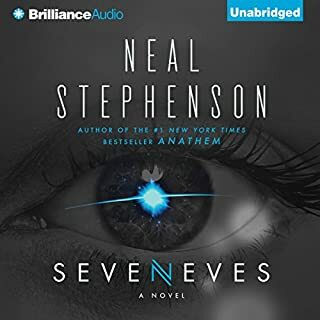 None of this was a dealbreaker, I still really enjoyed the book, but what could have been a truly stellar (no pun intended) audiobook fell short. The Jordan Foundation sponsored the Proxima Centauri Expedition in 2119, in attempt to reach the nearer stars of the galaxy. But that was far in the mythic past. The original purpose of the Ship's epic voyage has long been forgotten, and for generations the giant spaceship, lost between the stars, is the only world that the people aboard have known. A strange civilization has evolved, with its own superstitions, savage religion, rigid class structure and mutant outcasts. Brilliant first half, second half thrown in. I've liked what little Heinlein I've read in spite of his poor characterization of most of his women, but this felt like it was really stuck in the past. Here we are in a ship where everyone surely *must* have a role in order to keep it running, but women are not only not in roles of power, they barely exist -- not even in supporting roles. Their detailed plan of keeping mutations out of the gene pool was discussed, but none of the main characters even had wives so I found myself wondering where, exactly, were these children even coming from? The second portion reveals that they're more or less treated as possessions, rather than functional crewmembers, except for one woman among the Muties. I know he's trying to show what might happen when people lose their own history, but in positing that women will revert to being chattel I think he missed the mark. Beyond that (large) sticking point, I think it was interesting sci-fi, but it felt un-polished and like it was missing a great deal, but short stories often are. 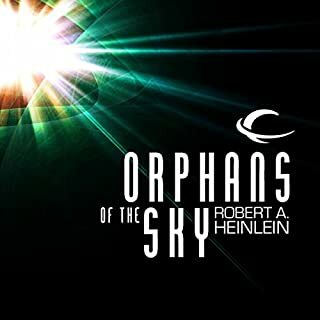 In my opinion if you're looking for Heinlein or classic era sci-fi you can find better than this, but this wasn't a bad listen. People have called this. More than "dark", this goes into sexual coercion in a way that left me uncomfortable. I'll be honest, when another series had a reader switch, I thought the switch was BAD, AWFUL! But I have to say that, some strange pronunciations aside, I liked this reader SO MUCH better than the original. Seriously. I think I might be the only one, but the other reader kinda drives me crazy. What Gigi did well: First off, I think she really sounds like a midwesterner. She seems no-nonsense, like Rachel would be. And some of her voices weren't bad either, though in some cases they simply weren't what I was used to. And Jenks being as high-pitched as she made him was sometimes tough to listen to -- but given how often Rachel winces at his and the other pixies' speech, well, I feel like she got that right. Not so good: Changing the pronunciations from what we're used to for character names. You can argue 'til you're blue in the face about how it's supposed to be pronounced, but I haven't seen/heard anything from the author giving the definitive ways to say Piscary, Algaliarept, and Takata so I'm guessing as much as the narrator apparently was. And pronouncing Mackinac two different ways (one incorrect), well, I don't know why somebody didn't make her go back and fix it. But more important than that, I didn't love the voice she did for Ceri or Ivy. It's a moot point, as the series has long since switched back to the other reader, but I wanted to review this one just to provide a voice saying, you know, I really didn't mind the switch. Now: Onto the book itself! I think this is the best-written of the series so far. I'm so glad not to have heard several of the repeated phrases that became extremely noticeable as the series has progressed. Hopefully, this book will be a turning point. The reading was good. The book itself was not great, but it was good enough that I'd like to see where the story goes. 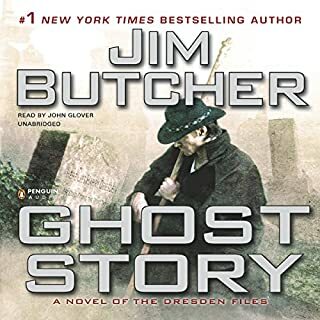 Perhaps Jim Butcher will have had a better idea what he wants to do with these characters as it moves on, after all! The recording was driving me crazy. As others have noted, the horns interject at seemingly random times. If, as others have said, they marked the beginning/ends of CDs, they were a terrible idea for CDs and I'd have hated them on that. 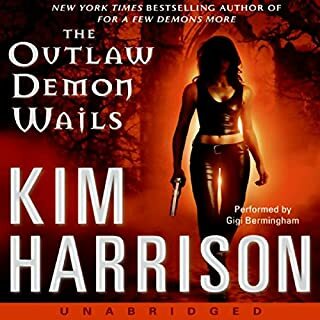 They're a worse idea at random in the otherwise-unbroken audiobook. And it will be stopping me for continuing further in this series in the audio format because it's THAT irritating. In contemporary London, Michael Kearney is a serial killer on the run from the entity that drives him to kill. 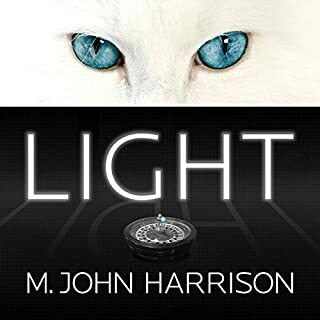 He is seeking escape in a future that doesn' t yet exist - a quantum world that he and his physicist partner hope to access through a breach of time and space itself. At first, I didn't love this book. I wasn't really liking any of the characters, wasn't really interested in what was going on... and then, suddenly, I began to change my mind and I can't even explain why. All I can really say is that one day I found myself wondering what happened to one of the characters, then another character the next day, and soon I was actually concerned about them all. 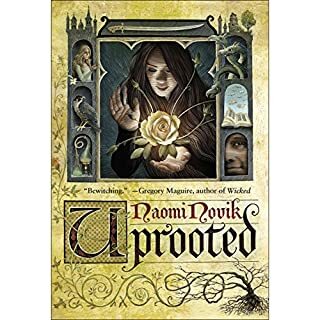 I didn't find the end disappointing at all; without spoilers, I can say that it just seemed right and I'm very glad I stuck with this book, despite my attention not being caught immediately. It was a pleasure to hear how these stories all came together. As someone who only recently began this series, I was glad to have caught up just in time for the new book. But, since I began the series via audiobook, I was heavily invested in James Marsters' narrative style. Honestly? 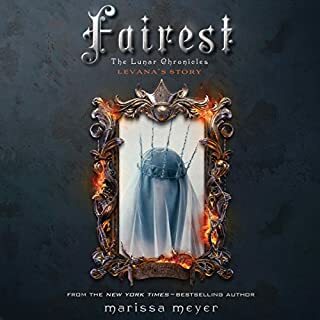 I wish they'd delayed the audiobook release until Marsters could be available to read it. And I hope that, with all the reviews on Audible, Penguin considers that when handling their next series book. Another reviewer commented that, because of where this book picks up, it makes sense to have a different voice. I tried to tell myself that as well but, when it comes right down to it, I think that John Glover's voice wasn't the right one to pick. 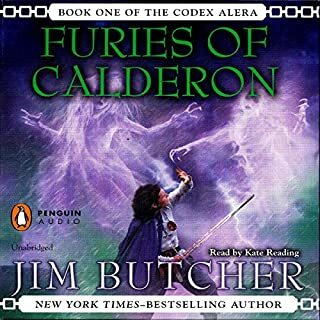 To me, Harry Dresden now sounds like Waldo Butters (and when the two of them talk, forget about keeping them straight!). I kept thinking about Butters long before he appeared in the story. I could have lived with it if Butters (and any of the other secondary characters) hadn't sounded the same as he had before, but the pitch of Glover's voice just isn't right for the character I've been following for 12 books now, which is too bad. That being said, Glover does a good job with the book. If it hadn't been a series where we'd had a consistent narrator for so long, I think I'd have been very pleased with him. But no, he's just not Harry.